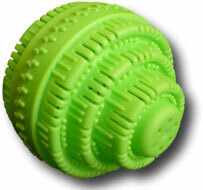 Last weekend I bought an eco laundry ball – I was unconvinced that this large plastic ball with beady things in would do anything other than waste my money…I was completely surprised. Not only did the washing come out clean, it smelt clean and fresh, very soft and with very few creases. The added plus is that the expensive water recycling system we have planned for our garden and household use was not necessary. We only need to by a water tank and loop the water back into the house. No harsh chemicals to take out the water, no worrying about the effect it might have our plants. A note should be made – I tried washing in warm and cold water, warm water is recommended on the box. Warm water had better effect. Make sure the ball is put in the sun for at least 2 hours before initial use. Clean out your machine as per box instructions before using the ball for the first time. It is important to wash out your machine with vinegar on a long hot water cycled each month. I give it a 5 star rating! Try it out you might be pleasantly surprised. I found mine at a health store in East London but if you need, http://www.agreenworld.co.za/ sells them and other green products. Please drop me a line and let me know your experience with the product. NEVER BUY WASHING POWDER OR FABRIC SOFTENER AGAIN, WITH THE NEW ECOWASH LAUNDRY BALL. Whilst it has probably not crossed your mind as a potential cost-saver, the fact that you can now do away with washing powder and fabric softener must surely find appeal in an age when the cost of living is steadily increasing. After all, washing powders and fabric softeners are expensive. (Something that any mother with children will attest to). And not only are they expensive, they’re not good for the environment. With the new EcoWash Laundry Ball, you can say goodbye to your washing powder and fabric softener purchases forever. Simply place the Laundry Ball into your washing machine with a 4kg load, and switch it on the way you normally do. There’s nothing more to it than that. What you’ll get at the end of the cycle is a brilliantly clean wash, soft as can be. Besides saving electricity and water, you’ll be helping the environment as without the need for harmful washing powders and fabric softeners, there will no chemicals released into our water and the atmosphere. And no more skin rashes or itchiness, either. This environmentally-friendly product has drawn rave reviews from people across the spectrum; from those who appreciate the doing-away with washing powders and fabric softeners to those who like its ease-of-use, and the fact that it doesn’t cause rashes and skin itchiness in their children. With the Laundry Ball, you’ll have no need for detergents (many of which contain chlorine, which ages your clothes’ fibres and causes them to go pale). By not using chlorine, your clothes will preserve their colour and last longer. Your clothes will come out perfectly clean and wonderfully soft. Not only will the EcoWash Laundry Ball save you electricity, it will also save you water – putting money back into your pocket, week after week, month after month. What’s more, this unique and eco-friendly product will help your family’s clothes last longer. A win every which way and a product that should appeal to every household operating on a budget. To all intents and purposes, the EcoWash Laundry Ball is the same as the Miracle Wash Laundry Ball used in Australia. You may find a visit to www.laundryball.com.au interesting.